Obama, Congressional Republicans Continue Debt-Limit Stare Down : It's All Politics Thursday was another day lost to the political stare down between the nation's most powerful Democrats and Republicans in the Great Debt-Limit Debate of 2011. Sen. Mitch McConnell invited President Obama to the White House to hear once more why Congress wouldn't approve any agreement that included tax increases. Obama, for his part, essentially said no and headed to Philadelphia fundraiser. 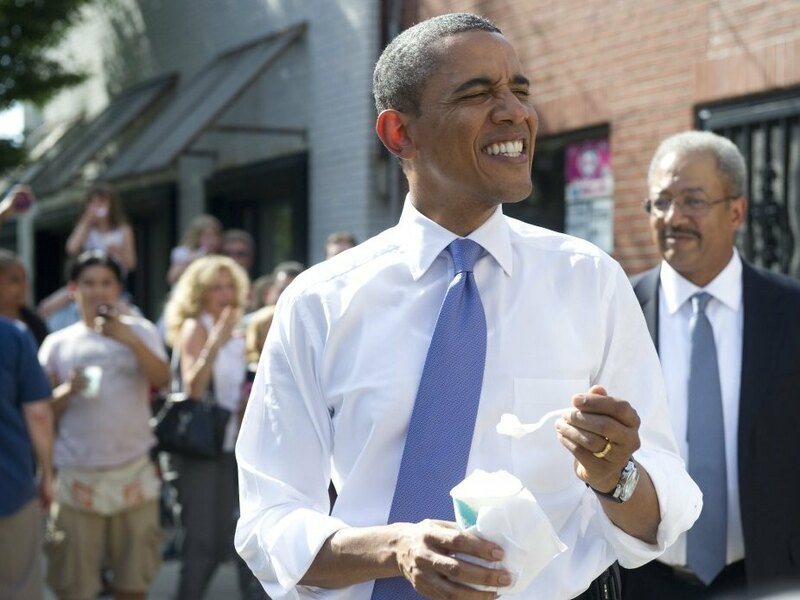 President Obama eats an Italian ice during an unannounced stop in Philadelphia where he attended political fundraisers. Thursday appeared to be another day lost to the political stare down between the nation's most powerful Democrats and Republicans in the Great Debt-Limit Rumble of 2011. Sen. Mitch McConnell invited President Obama to the White House to hear once more why Congress wouldn't approve any agreement that included tax increases. Obama, for his part, essentially said why bother and headed to Philadelphia for two campaign fundraisers as he tries to build a big enough campaign war chest to significantly outspend whoever eventually becomes his GOP challenger. The president sent his regrets through White House press secretary Jay Carney who said the president didn't need to go to Capitol Hill to once again hear the Senate's "maximalist" position, using the same word Obama did in his day-earlier news conference, a word that sounds vaguely like the name of the main character in Gladiator. Republicans tweaked the president for going to the fundraisers, saying he should have remained in Washington to hear, for the umpteenth time, why they will support only spending cuts, not tax increases, in any debt-ceiling agreement. Meanwhile, the Senate's Democratic leadership decided to keep the body in session over the holiday week to try to work towards an agreement. But how any progress would be made was far from clear since House Republicans are sounding even more adamant than their fellow Republicans in the Senate that they won't be voting for any tax increases. So this long Washington-style stare down continues. Not quite as edgy as the stare down between heavyweights Wladimir Klitschko and David Haye whose title fight is scheduled for Saturday. At least, not yet.